For years, I thought I didn’t like guacamole. The bright green goo that would occasionally appear at house parties, game day gatherings and Tex-Mex restaurants held absolutely no appeal for me. I would turn my nose up at it when I saw it on display. “No, thanks. I’m not a fan of mush,” I’d say. Others tried to convince me that I didn’t know what I was missing out on, that I should try, ‘insert texture-less, tasteless store-bought brand name here’, because theirs was reaaaally good. I would occasionally, against my better judgement, try the green goop again. Still, I remained unimpressed. Then, after my first trip to Mexico, I realized that most of what we call guacamole here in the US… ain’t. What I tasted at beachside shacks and streetfront restaurants in Mexico was not a uniformly smooth green spread, it was more like an avocado salad – it had big chunks of the lovely pale green fruit; it tasted bright and fresh and was something I could literally sink my teeth into. I dug into it gleefully at every meal during my trip, amazed out how simple the mixture of ingredients was, and how unlike the ‘gwaca-mohl’ I was used to seeing and tasting stateside it was. After returning from my trip, I was inspired to start making this chunky (and dare I say, more authentic) guacamole in my own kitchen. I’d serve it to visiting guests and carry it along to potluck shindigs. Apparently, I got pretty good at making it, since my friend Regina confided in me, “Yours is the only guacamole I’ll eat.” Apparently, she’d had the same ‘get-that-green-go-outta-here’ feelings that I’d had for years, and I had made her a convert. So, this one is not just for you other would-be converts, it’s for Regina. And for the potluck party that she’s having this weekend that I won’t be able to attend, but my guacamole will be. For me, the perfect guacamole starts with pico de gallo – a mixture of tomato, onion, cilantro, and lime juice that forms the base of the ‘avocado salad’. If you don’t yet have the technique down, figure out how to properly cut an avocado. It’ll help cut down on prep time and just make your guac look prettier in the bowl. Avoid using a metal bowl or spoon – metal can cause the avocados to turn brown. If you’re making the guac ahead of time, squeeze a little extra lime juice over the top of the completed salad (acid acts as a mild preservative), and cover with plastic wrap touching the top of the salad. This will limit the air contact that causes the avocados to oxidize and turn brown. Add in extra flavor to the pico as you desire – diced jalapenos, fresh(!) minced garlic, ground cumin, diced mango, finely chopped cooked shrimp. These add-ins will transform your standard guac into something even more impressive. Don’t stir too much once the avocado is added. This is especially important if your avocados are very ripe. The more you stir, the mushier they’ll become. 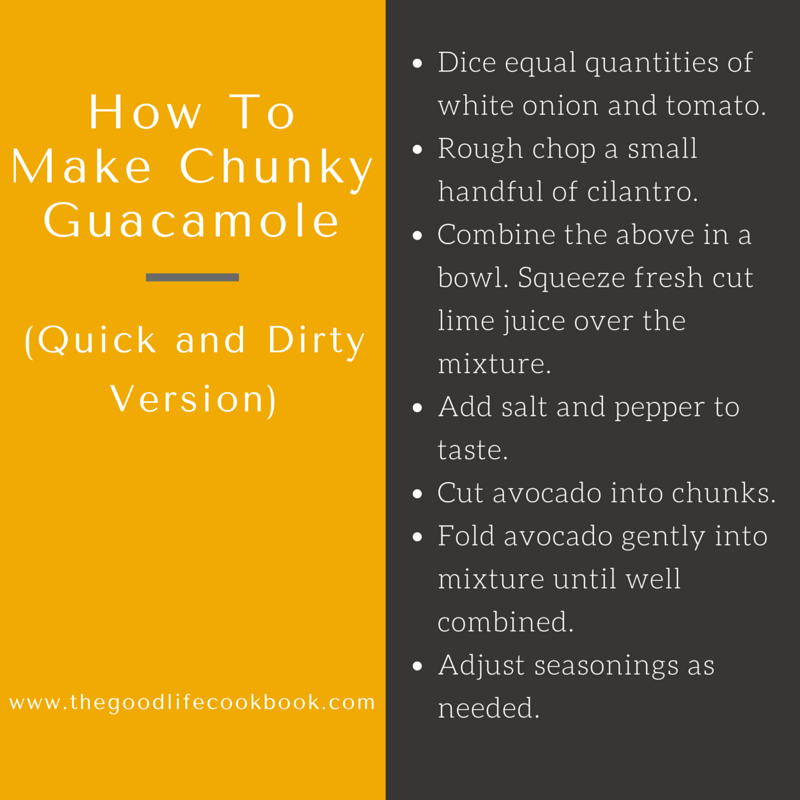 I hope you try this recipe for chunky guacamole at home, and I hope you can make some converts out of your friends who may think they don’t like guac. Are you a lover or a hater of guacamole? Would you give this recipe a try?